Study your GCSE mathematics course online. Over 3600 pages of content ranging from illustrations and explanations to 1600 fully worked and printable exam questions and 850 o-tests (on-line assessments). Almost every page is interactive offering you much more than simply an online text book.. Ideal for student self tuition, revision, testing and teacher demonstrations. Over 1600 fully-worked and printable Exam Questions based on exam papers from many different exam boards. Choose which questions you require. A display will show you how many questions you have selected, their total worth in marks and the total time you should spend on them. Print out your own selection together with a mark scheme. 850 Online Tests - offering online testing and automatic assessment! Suitable for all exam boards. Take a look around the site. A complete assessment package has been added in to the site, enabling students to record and track their progress using a variety of tests and challenges. We recommend that Schools and Colleges purchase the Institution Subscription, which enables teachers to be provided with records of all student progress for diagnosis, feedback and help. Everything is marked and assessed automatically on-line and results are fully downloadable to your spreadsheet. For further details see MathsNet GCSE or to order see below. IMPORTANT NOTE: If you are a TEACHER then in order to get access to the links for teachers, you need to either be ordering an institution subscription or multiple user subscription. If you are a teacher and only require a single user subscription then please contact the Chartwell-Yorke office to place your order on 01204 811001 or orders@chartwellyorke.com and we'll make a special arrangement for you. Helpful note: When renewing your subscription, you'll get a renewal link that invites you to log back in to the CY Maths online shop to renew. To do so you need to log in to the shop using the private password you will have chosen to set up with this shop, rather than the Mathsnet password we will send you upon subscription for logging into Mathsnet. Or just give us a call. 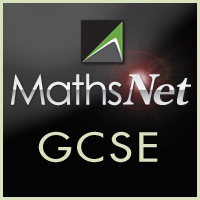 MathsNet GCSE, online tuition, revision and testing. Single User 12-month subscription giving access to a student or teacher whenever and wherever they wish. Institutions may buy any number of single users in one purchase, which would be economic for them for up to 9 users (thereafter it's better value to go for the institution subscription). MathsNet GCSE, online tuition, revision and testing. Annual subscription providing access for all staff and students of the purchasing academic institution, whether at the institution, roaming or at home. A complete assessment package has been added in to the site, enabling students to record and track their progress using a variety of tests and challenges. We recommend that Schools and Colleges purchase the Institution Subscription, which enables teachers to be provided with records of all student progress for diagnosis, feedback and help. Everything is marked and assessed automatically on-line and results are fully downloadable to your spreadsheet. If you'd prefer to be invoiced rather than order online with a credit or charge card just send your official purchase order to us at Chartwell-Yorke, 114 High St, Belmont Village, Bolton, Lancs, BL7 8AL, UK, orders@chartwellyorke.com. This is a multi-user account for two users: the parent/tutor and the student. The parent can then use all the facilities normally available to the teacher in a school account, namely: (a) set homework tasks using our 724 on-line assessments, which are marked instantly on-line (b) view and manage progress of the student on the homework tasks (c)print exam papers and accompanying mark schemes based on our collection of 1217 exam questions (d) print from a huge collection of worksheets (in Excel format), most of which contain hidden answers. As a parent or tutor, you will need to organise your student's GCSE preparation to correspond to a relevant exam specification. This specification may be Higher (grades D to A*) or Foundation (grades G to C), modular or linear or even an iGCSE. We recommend that you contact your student's school to find out which precise syllabus the school is following, or, if you are setting up a home-education program then you need to decide on this yourself. All the exam boards provide comprehensive on-line assistance and you can download a detailed specification from all of them. Click on the title or icon to the left for further details and links.